(TibetanReview.net, Aug02, 2018) – The Arunachal Pradesh state government and the central Tibetan Administration (CTA) have on Jul 31 launched at Dharamshala a programme of cultural exchanges and student ties between the two sides which share a territorial boundary and historical cultural links. The launch has taken place during the visit of Mr Jamphel Wangdue, Chairman of Religion and Cultural Affairs of the state government. 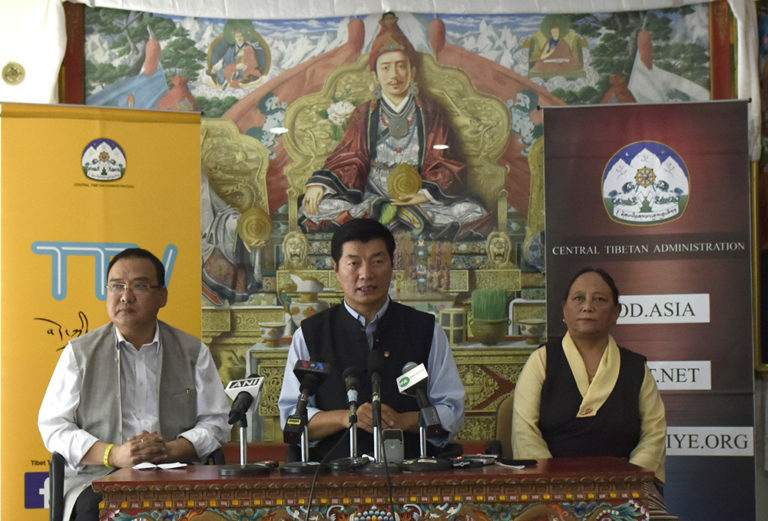 He has addressed the press with the CTA President Lobsang Sangay and the CTA’s Additional Secretary at the Department of Home Mrs Tsewang Dolma Shosur. The programme was also stated to be a step towards restoring communal harmony in Arunachal Pradesh in the backdrop of recent protests and agitations carried out by a fringe section of the state’s student community against the implementation of the Indian government’s 2014 “Tibetan Rehabilitation Policy”. The group seeks to spread the false notion that the policy would be at the expense of the state’s tribal community’s well-being despite it being explicitly stated to be subject to their well-being and rights being fully taken care of first. Jamphel Wangdue has announced that 10 Monpa students from Arunachal Pradesh had joined the CTA’s Tibetan Institute of Performing Arts at Dharamshala to gain knowledge and practical experience of Tibetan culture and traditions. The Monpa tribals constitute a prominent section of the Arunachal state population and they share the closest of cultural and historical ties with Tibet. He has called the recent agitation in the state targeting the Tibetan community a sad development and assured that a meeting would be held on Aug 12 to find a solution. He has said that for the purpose of soliciting support from various student bodies in the state, including All Arunachal Pradesh Students Union (AAPSU), All Monpa Students Union (AMSU) and All Tawang Students Union (ATSU), a meeting would be held and a plan of action worked out to resolve the ongoing agitation being carried out by a student body. He has also said that a mass awareness programme on the state’s centuries-old cultural and religious ties with Tibet will be launched. Tsewang Dolma Shosur has said the current situation facing the Tibetans in the state amid the ongoing disturbance was not as dire as allegedly portrayed in the internet social media platforms.